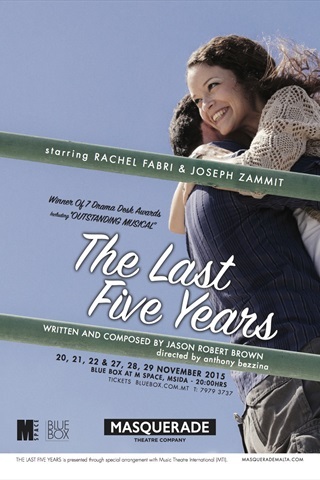 THE LAST FIVE YEARS is a multi award winning, emotionally powerful and intimate one-act musical about the two New Yorkers in their twenties who fall in and out of love over the course of five years. Written by Tony Award winning composer Jason Robert Brown, the shows unconventional structure consists of Cathy (played by Rachel Fabri), a vivacious struggling actress, telling her story backwards while Jamie (played by Joseph Zammit), a hotspot up-and-coming novelist, tells his story chronologically; the two characters only meet once, at their wedding in the middle of the show. The show has been produced at almost every major regional theatre in the US, and has been seen in Korea, Japan, the Philippines, Germany, Italy, Canada, Spain, South Africa, the UK and now Malta. THE LAST FIVE YEARS is directed by anthony bezzina. Jonathan Ellul leads the live band of 5 musicians and Cathy Lawlor is the vocal coach. The show stars two of Malta's brightest performers: Rachel Fabri as Cathy and Joseph Zammit as Jamie. Set design is by Aldo Moretti. THE LAST FIVE YEARS is sure to take your breath away! Do not delay! This multi-award winning musical masterpiece runs only for 6 shows.